His passport says Ethiopian legend is 39, but there’s reason to believe otherwise. Every morning, Haile Gebrselassie trains with a select group of runners in the Entoto Hills east of the Ethiopian capitol of Addis Ababa. It’s been his routine for many years. 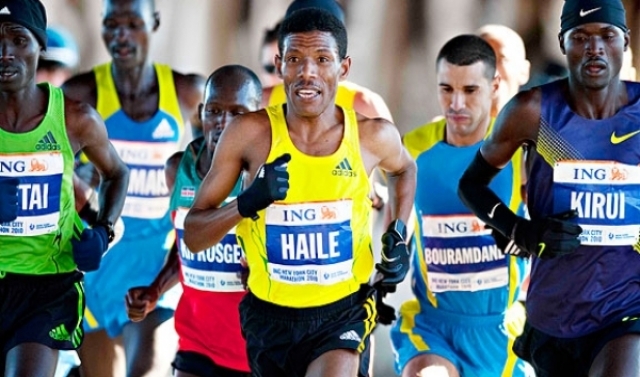 One morning in February 2008, Haile’s group, whose composition changes a bit from day to day, included Hirpasa Lemi, husband of Berhane Adere, a multiple world champion on the track and on the roads. Also present — as an observer — was Matt Turnbull, an Englishman who now works as the elite athlete coordinator for the Competitor Group’s Rock ‘n’ Roll Marathon Series. After meeting up, the 10 or 12 runners comprising that day’s group separated into smaller packs, each of which went off to do its own workout. Ninety minutes later, everyone reconvened back where they had started. The only non-professional runner in the group, Lemi was proud to have held his own. “I don’t know — 50,” Turnbull joked. Everyone laughed. Everyone except Gebrselassie, whose passport states his date of birth as April 18, 1973, making him officially 34 years old, almost 35, at the time. Lemi knew otherwise. He had grown up with Gebrselassie in the Arsi Province. Like most rural Ethiopians, Lemi could not prove his own exact date of birth, but he knew it was approximately 1967, and he remembered that Gebrselassie had been small when he was small, that Haile had hit puberty when he hit puberty, and so forth. Lemi was not alone in this knowledge. The extreme “rounding down” of Gebrselassie’s age was the worst-kept secret in the Ethiopian running community. That’s why everyone laughed when Lemi made reference to it. Everyone except Haile. The discrepancy between Gebrselassie’s stated age and his true age had no real significance before this incident. He was inarguably the greatest runner in history, and the murkiness of his age did not color his achievements one way or the other. But seven months after this episode, Gebrselassie broke his own marathon world record in Berlin, running 2:03:59. If Gebrselassie is even 4½ years older than his official age, instead of the six-plus years that Lemi insinuated, then the fastest marathon at the time was run by a 40-year-old man. History’s first sub-2:04 marathon is a great accomplishment in itself. But if it was truly run by a Masters athlete, when the recognized Masters world record is 2:08:46, then Gebrselassie’s performance undoubtedly stands as the single greatest running feat of all time — a performance that destroys our existing beliefs about the effects of age on running capacity. And Gebrselassie deserves credit for that. Ironically, however, he doesn’t want it. Click here to read more at ESPN.